Ingrid Braun has a lot of weight on her shoulders these days. About 300 pounds worth, actually. 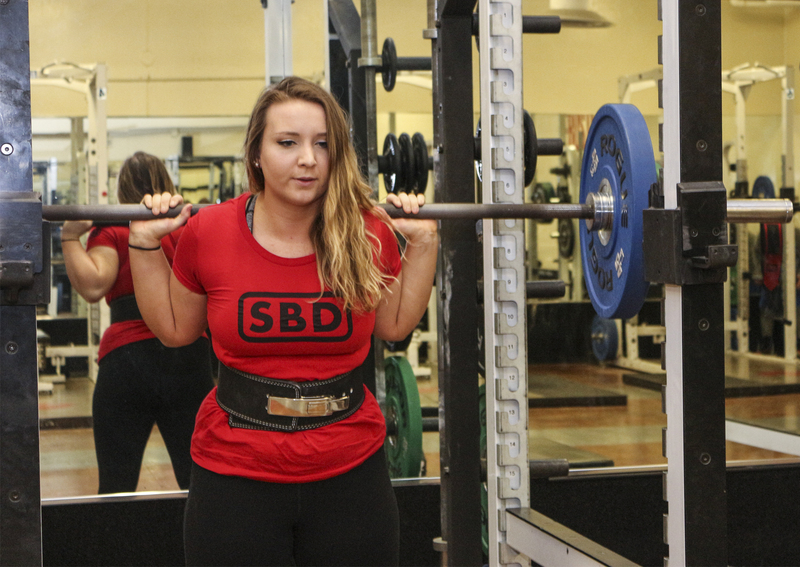 Deadlifting 292 pounds at a regional meet sent the FSU wildlife biology and fisheries major to the USA Powerlifting Collegiate Nationals at Texas A&M University in April. There she topped the 300 mark, deadlifting 303 pounds. Braun, who is considered a raw lifter, meaning she doesn’t use the assistance of a squat suit or athletic wrapping, also holds records for squat lifting. 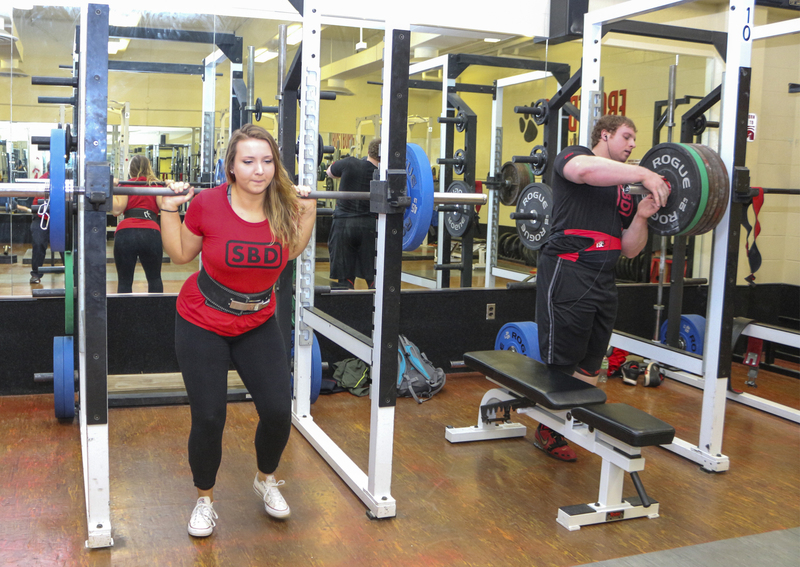 At the regional meet, she set a record for squatting 243.2 pounds, a mark she later topped by nearly 50 pounds at the Nationals, squatting 292. Braun does not think she would have been able to go to a national competition without Nazelrod’s help, but gaining his advice was harder than anticipated. When Braun, a White Plains, Md., resident, was in her first year at FSU navigating classes and college life, she decided to hit the gym to get back into shape. Shortly after that, the desire to lift weights pointed her to a serious run at powerlifting. Braun noticed a hulking figure with a laser focus in his eyes lifting in the Cordts PE Center gym. She wanted to ask him for powerlifting tips. She was even in a chemistry class with him but couldn’t find time to make small talk. Later, she read a Frostburg State University story on the man, Nazelrod, a geography major from Oakland, Md., and knew even more she needed to find a way to talk. Competitive powerlifters by nature are in a deep state of concentration to safely and effectively lift hundreds of pounds. It’s easy to understand why the affable, yet shy, Nazelrod looked like he had better things to do than converse in the gym. Once Nazelrod removed his headphones to talk to a trainer, Braun swooped in to introduce herself, quizzing him on what weightlifting program he’s using in training, hoping to get an idea of what would work for her. Braun then decided to enter a USA Powerlifting meet at a Frederick CrossFit gym on Nazelrod’s recommendation. He was willing to assist anyway he could. “He fully got me prepared and was my handler at that meet,” Braun said. He also wrote all of her programming. Nazelrod said he likes to pay it forward. When he was a first-year student, it was the powerlifters ahead of him at FSU who helped him get started. From there, he fell in love with the sport. In the USA Powerlifting Collegiate Nationals, Braun competed in the Junior 84kg weight class against other full-time female college students. Nazelrod competed in the 120kg-plus weight class in the men’s division. The two represented Frostburg State in the meet. Nazelrod said Braun has the competitiveness to go far. As much as Nazelrod inspired Braun, she discovered a supportive Instagram community inspiring other female powerlifters. Braun, in turn, posts her fitness routines and accomplishments there on @iBraunFitness. Braun said this journey taught her perseverance after seeing what she could do after stepping away from weightlifting. She had taken weightlifting classes in high school starting in 2013, but her senior year schedule didn’t allow her to continue the class, even though she tried to keep her hand in at the local gym. “Once you get back, you think it’s going to be a long journey, but since I never completely stopped, I was able to gain my strength back fast. Not only was I going past my high school weights but I’m going into new territory in my lifts,” Braun said. “It’s just a really big milestone to hit,” she said. And hopefully one of many more to come. Ingrid Braun and Tristan Nazelrod training together.